Anyone with kids in this day and age knows that bringing a nut product to a public gathering is pretty much as socially awkward as showing up naked would be. 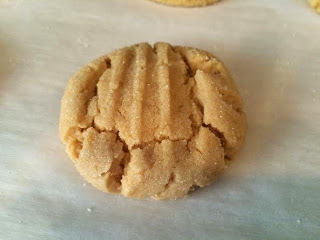 So..... when we're looking for a delightful treat that isn't going anywhere past our kitchen, this is a go-to peanut butter cookie recipe. It's not crunchy. Sort of chewy, but still soft. *When choosing your peanut butter, I recommend a natural, unsweetened type. Anyone who knows me will know that I do NOT jump on the all natural bandwagon very often. I LOVE my junk. Since having kids I've decided that I'd rather save the sugary sweet bribery to actual candy, so try to feed them "good stuff" where it's easy and totally interchangeable! Plus, in a cookie recipe, you don't need to use a peanut butter full of added sugar. They're sweet enough, trust me. 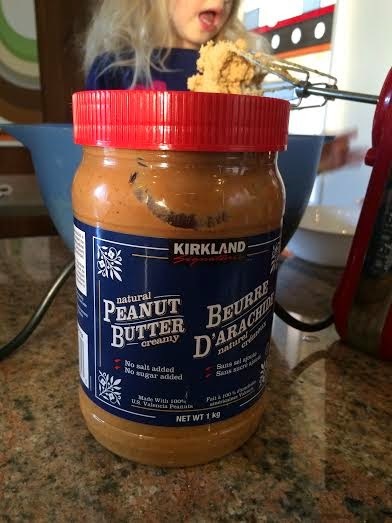 My personal fave: Costco's Kirkland Natural peanut butter. 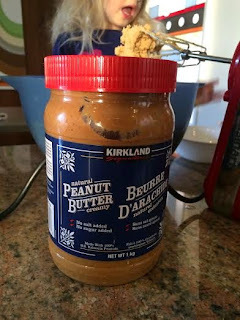 Ok. You've got the right peanut butter now. Let's begin. Cream the butter and peanut butter with an electric mixer on medium speed until evenly combined. Add the sugars and cream until light and fluffy. Add the baking soda and powder and beat on low until combined. Add the egg and vanilla, and beat until evenly mixed. Switch it up to a wooden spoon and stir in the flour gradually. Once you hit one cup of flour, keep adding up to 1/3 of a cup until the dough is nice and stiff and would easily be able to roll into balls. If it's too sticky after adding all of the flour, stick it in the fridge for a few minutes. This has only happened on very hot days or if I've gotten distracted and my dough has warmed up while gabbing on the phone or swearing at a telemarketer. Shape dough into 1.5 inch balls, and then roll in sugar to coat. Place on parchment lined cookie sheets approximately 2 inches apart. Lightly press down with the tines of a fork. Bake in a 375 oven for about 9 minutes. Do not overbake! When you remove them from the oven, let them firm up on the cookie sheet for 2-3 minutes before transferring to a wire rack to cool completely. 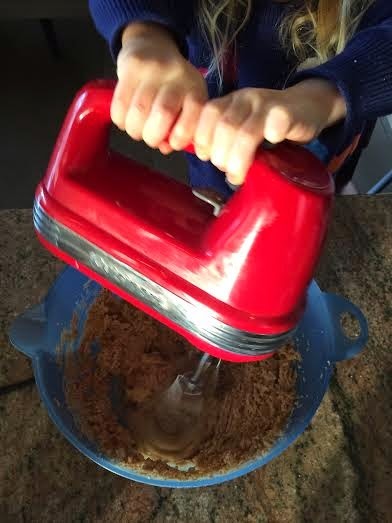 This recipe usually yields about 30 cookies.